Vanessa: There are so many things I love about Sundays. Apart from the obvious of it being a day of rest, the opportunity for a lazy brunch is one that I find hard to pass up. On this particular sunny Sunday, my good friend Pete suggested we gather the troops to try one of his local favorites. Enticed by Pete’s endorsement of the coffee quality, we found ourselves meeting at the quaint, sandstone café that is home to Bitter & Twisted in Millers Point. The interior is rather small but it has an open feel and the sandstone exterior adds a very charming element. There is also the option of outdoor seating for smaller groups, but we were a party of seven that day, so were seated on one of the communal tables inside. There are some lovely, unique features inside the café that further add to the charm including a an interesting coil tap, where patrons can help themselves to water. I want to make mention of the fact that the staff at Bitter & Twisted are very friendly which further adds to the relaxed atmosphere of the café. The weekend breakfast menu offers a selection of your expected options which thankfully sped up the decision-making process as I abide by a strict “order then talk” policy 🙂 . As the highly anticipated coffee arrived at the table and the first sips were taken, it did not disappoint. My skim latte was rich, creamy and bold, as it should be. Fresh juices were also ordered served in the “so hot right now” mason jars, which actually led to a fact finding mission on when and where the mason jar originated. 1858 in Philadelphia…FYI! The food arrived quite quickly and we had chosen a cross-section of dishes between us. I’ll leave my own choice to last and mention the others first. Two of the group chose the Polish Styled Scrambled Eggs ($14.50) with ham, mushroom and spinach served with sourdough. This was very much a mix of all those ingredients combined and another educational moment for us in learning how scrambled eggs are served in Poland! Another two chose the grilled haloumi and poached eggs ($17.50). This was stacked on sourdough toast, baby spinach, balsamic & roasted tomatoes with Hollandaise sauce. I had some major food envy over this dish as not only did it look visually appealing I was told it tasted delicious as well! My dear friend Cos, who is somewhat of an egg aficionado went with the smoked salmon and poached eggs ($17.50). I watched as she cut into the egg and saw the rich yolk ooze from the centre and instantly I knew she was on to a winner. Another chosen item that morning was the Eggs Benedict with Salmon ($18.50) served on English Muffins with Hollandaise sauce. Im told the taste was spot on but my observation was that it was a fairly small portion. 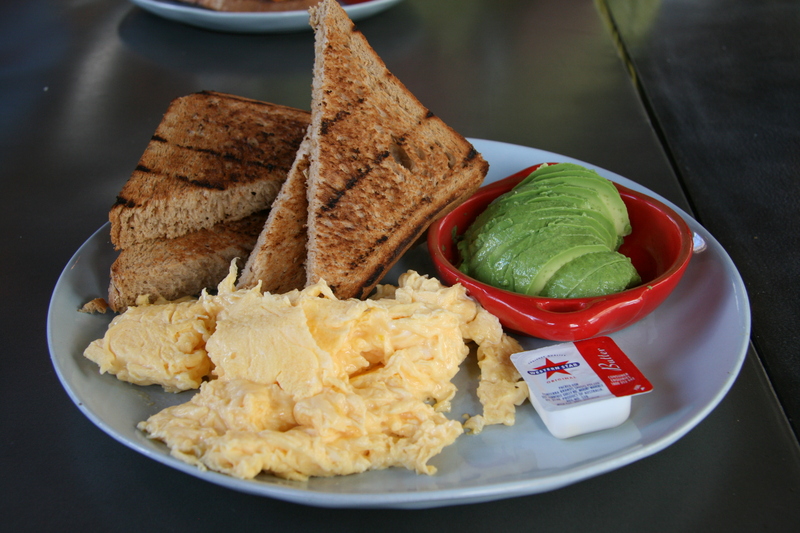 Last but not least, I chose the humble scrambled egg with a side of avocado ($14.50), served up with four pieces of wholemeal toast. A very substantial serve of all elements and I was quite full by the end. As you can see we all opted for egg based dishes that morning but the cafe also serves up healthy muesli, porridge and the not so healthy buttermilk pancakes and french toast. We settled up after our pleasant brunch experience and headed off the enjoy the rest of our day feeling content. I am very pleased to have come across the café and can definitely recommend it for a good caffeine hit with some solid breakfast options for a relaxed weekend catch up!